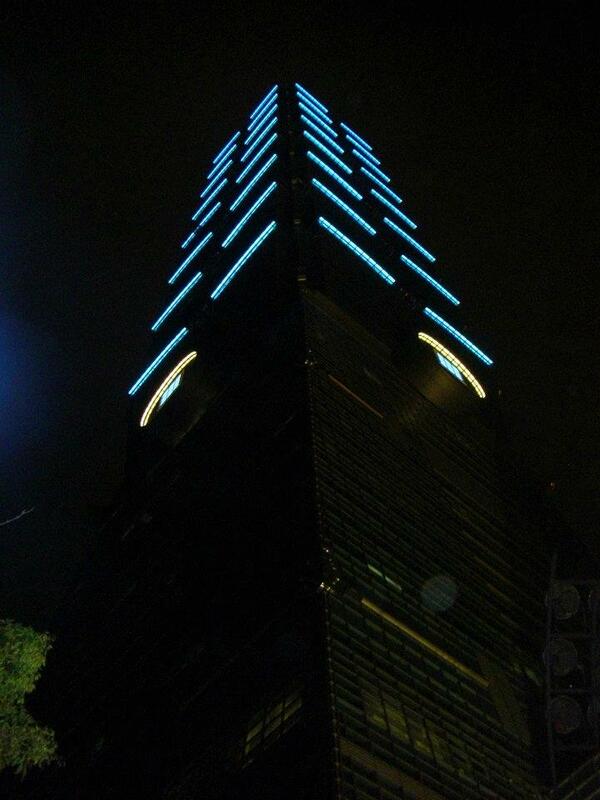 Taipei 101 is one of the tallest buildings in the world. The third tallest, as I write this, but buildings keep competing for this spot, so who knows how long these words will be up to date. 101 was ranked as the tallest building in the world for only six years. How many floors do you think it has? But there are actually five more floors underground, so it should be Taipei 106. It's more than half a kilometer high. Whoa. The elevator man will tell you all of that on your way up in several different languages, but it's hard to keep up with him. The blue-green glass offers UV protection to those inside. It's also supposed to give the building the look of bamboo--which was intentional, to show strength, growth and resilience. It may be an engineering feat,but there are elements of design evident all over the place. The repeating of 8 (a number of luck and prosperity) segments of 8 floors echo the rhythms of a pagoda (serenity) or a stack of Chinese money boxes (prosperity). Even the emblem over the door is meant to show three coins with central holes implying the number 1-0-1. Because it commemorates the renewal offered by the beginning of a new year and a new century: January (1) the first day (01). The building is even helpful in telling time as a giant sundial when its shadow falls in the adjoining park. 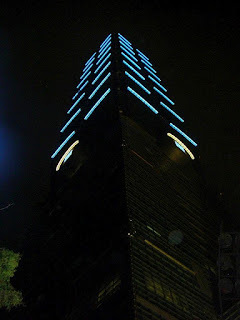 At night, Taipei 101 stands like a candle with a flame at the top, said to symbolize liberty and welcome. I visited on a Friday. The more I learn about it, the more impressed I am. The designers and builders could have just built a building to be the tallest. That's a pretty top level feat in itself. But the amount of thought they put into the design and character of the building makes it very likeable.